Thousands of devotees from Chandigarh, Panchkula, Mohali are going for Antim Darshan of Rev. Mata savinder Hardev Ji and Sh. 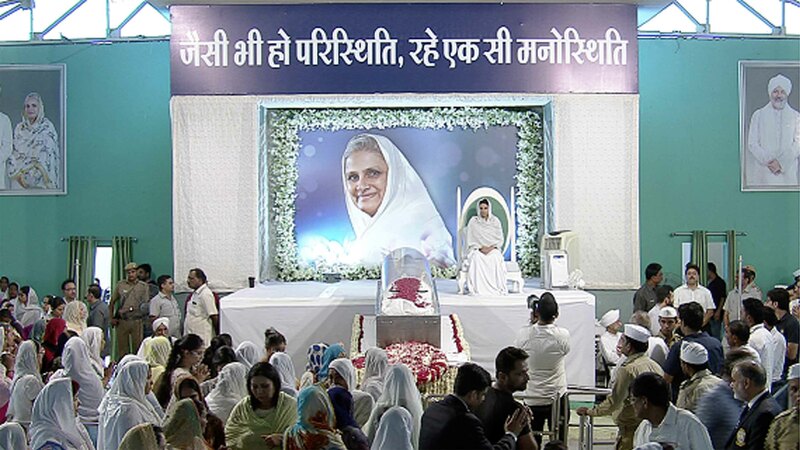 Kirpa Sagar Ji Member Incharge press & Publicity said that Lakhs of Nirankari devotees have been coming for Antim Darshan of Rev Mata Savinder HardevJi Maharaj who breathed her last around 5.15 p.m. yesterday. It’sestimated that from 1.5 lakh to 2.00 lakh devotees had paid their last respect to Mata Ji till this afternoon since her body was placed in Ground No.8 here at Burari Road last night. 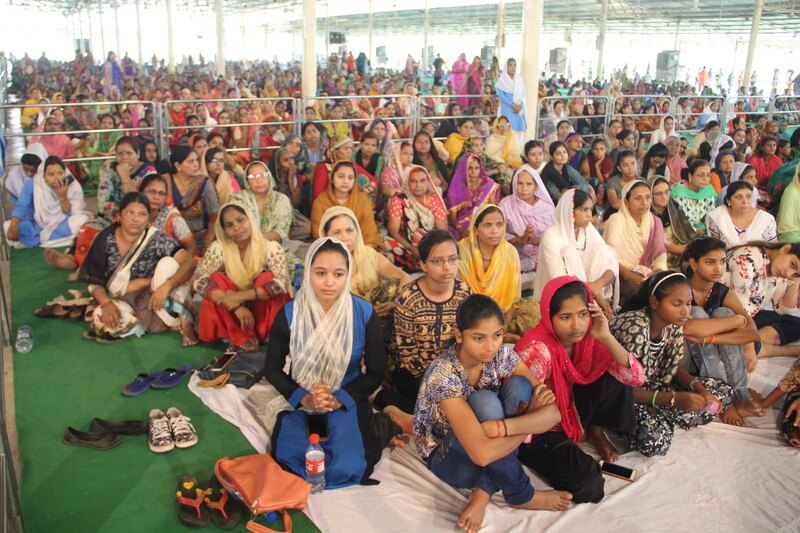 Besides all the members of the Central Planning and Advisory Board and Executive Committee of the Sant Nirankari Mandal, members of the holy family have also been attending the devotees. Nirankari Satguru Mata Sudiksha Ji Maharaj also spent some time blessing the devotees coming for Antim Darshan of Mata Savinder Hardev Ji Maharaj. Among representatives of other religious and social organizations, a delegation from SantKirpal Ashram also came and paid their respects. Rev Mata Savinder HardevJi, spiritually succeeded Baba Hardev Singh Ji Maharaj as Head of the Sant Nirankari Mission following his sudden merger into the Almighty Nirankar in a car crash in Canada on May 13, 2016. No doubt Satguru manifested in Her Holiness right from that moment, Sadh Sangat could see her identified with the same at a brief ceremony in Ground No. 8 in Delhi on May 17. Her Holiness, however, relinquished her spiritual powers as NirankariSatguru on July 16, 2018 and declared. Rev SudikshaJi as the Spiritual Head of the Mission from that day. The formal ceremony took place at a special congregation held in Ground No.8 in Delhi on July 17. Mata SavinderHardevJi applied the traditional sacred mark (Tilak) on the forehead of SudikshaJi, offered the sacred seat of Satguru and put the white scarf (dupatta), a symbol of NirankariSatguru’s spiritual powers round her neck. 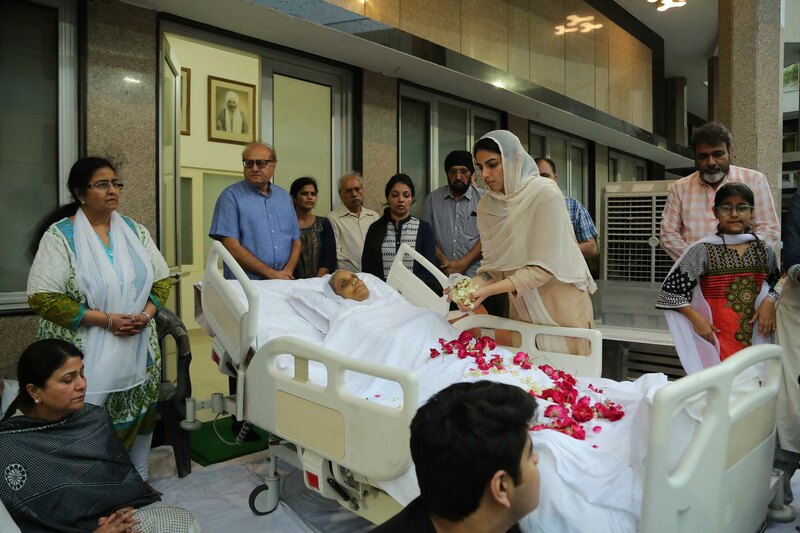 Obviously the decision came in view of Mata Savinder HardevJi’s deteriorating health. During her tenure of a little more than 2 years Satguru Mata Ji made every effort to take the Mission forward despite her health problem. Besides Annual Samagams in Delhi, Her Holiness blessed the State-level Samagams of Maharashtra in Mumbai along with two Regional Samagams of North-Eastern States in Kolkata and Siliguri and a State-level Samagam of Uttar Pradesh in Varanasi. In Delhi, Bhakti ParvSamagams both in 2017 and 2018 were held at SamalkhaNirankari Spiritual Complex. The Samagam in January this year also marked the launching of the development of the Complex. The ManavEktaDiwas in April, 2017 was addressed in Delhi while in 2018 Her Holiness blessed the main Samagam in San Francisco in USA. From May 13, 2017, a new Samagam – SamarpanDiwas was organized to pay tributes to Baba Hardev Singh Ji. The MuktiParvSamagams were held in Delhi as usual on August 15, 2016 and 2017. Satguru Mata SavinderHardevJiMaharaj also undertook long Salvation tours covering Andhra Pradesh, Telangana, Tamil Nadu, Karnataka, Maharashtra, Odisha, Madhya Pradesh, Uttar Pradesh, Uttarakhand, Punjab, Haryana and Chandigarh. Among countries outside India, long spiritual tours were undertaken in USA, Canada, UK, Dubai and Nepal. During Samagams and Salvation tours, it was seen at every place that devotees came in large numbers not only from local towns but other far off places also. Along with taking the Mission forward spiritually, Rev Mata SavinderHardevJi equally paid attention to its activities towards service to humanity. On Guru Puja Diwas in February, 2017, the Mission carried out a mega cleanliness and tree-plantation drive under the aegis of SantNirankari Charitable Foundation with special concentration on 263 big Railway Stations across the country. On the same day in 2018, the Foundation covered 635 Government Hospitals in 275 major cities in the country under the drive. On the World Environment Day, June 5, 2017 the Foundation conducted tree-plantation and cleanliness drive at 8 Hill Stations across the country that attract large number of tourists during summer. In 2018 it covered 14 Hill Stations in 7 States. Such campaigns were conducted in collaboration with Times of India and NDTV also. It was with the blessings of Mata SavinderHardevJi that in 2017-18 the Mission organized a record 514 blood donation camps in the country and donated 83,341 units of blood. Similarly, on a single day on ManavEktaDiwas, April 24, 2018, the Mission organized 84 blood donation camps where 19,307 units of blood were donated. Appreciating the exemplary spiritual, social and charitable activities, Mata SavinderHardevJi was given the ‘Spiritual Icon of the Year-2018’ Award by the US based international organization – ‘We Care for Humanity’. Rev C.L. Gulati; Secretary SantNirankariMandal received the Award on behalf of Her Holiness at a special function held in Kolkata on July 28-29, 2018. Mata SavinderHardevJi was born on January 12, 1957 in the family of Shri Manmohan Singh Ji and Mata AmritKaurJiresiding at Rohtak Road in Delhi. Later, the family shifted to Yamuna Nagar. The child Savinder was, however, adopted and brought up by ShriGurmukh Singh Ji and Madan Mata Ji belonging to Farrukhabad in Uttar Pradesh. 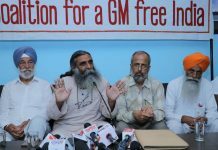 Since both the families were closely associated with the SantNirankari Mission, they sought the blessings of the then Head of the Mission, Shahenshah Baba Avtar Singh Ji, which made thisemotional arrangement a divine destiny for the child Savinder. SavinderJi’s primary education took place in Farrukhabad. Thereafter, in 1966 she was sent to an Irish institution, the Convent of Jesus and Mary in Waverly,Mussoorie from where she passed the Indian School Certificate Examination (Senior Cambridge, equivalent to Senior Secondary), in 1973. 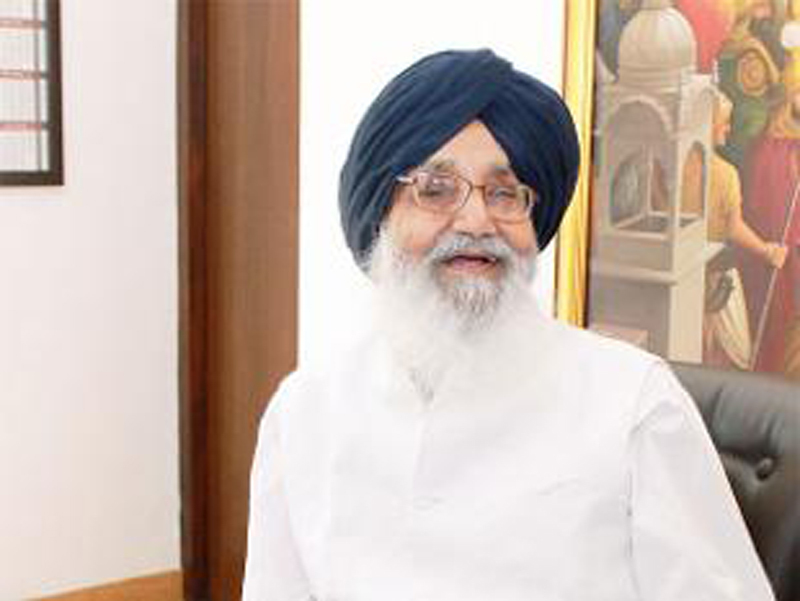 For higher education, SavinderJi joined the Daulat Ram College in Delhi. She was, however, married to Baba Hardev Singh Ji at a simple ceremony, on the eve of the 28th Annual NirankariSantSamagam in Delhi on November 14, 1975. In this way, she became a part of the holy family of Baba Gurbachan Singh Ji and Nirankari Raj mata Kulwant Kaur Ji as their gracious daughter-in-law. When Baba Hardev Singh Ji took over the responsibility as the Spiritual Head of the SantNirankari Mission in 1980, SavinderJi started being addressed by Nirankari devotees as Pujya Mata SavinderJi. She shared the dais with Baba Ji and RajmataJiand blessed the devotees who paid their obeisance at her holy feet as well. She moved shoulder to shoulder with Baba Ji during all his salvation tours in India and abroad and participated in every congregation and Samagam addressed by him. Her Holiness Mata SavinderJi always regarded Baba Hardev Singh JiMaharaj as Satguru first. All other relations would come later. They had three daughters SamtaJi, RenukaJi and SudikshaJi, but her love and care for them never came in the way to serve the Mission along with Baba Ji.